Reilly Turner, who played with the Titans during the 2011/12 campaign has been playing for the Canisius College Golden Griffins. Turner played in 13 games during the 2014/15 season and maintained a save % of .915 and a GAA of 2.54 with a record of 5-4-3. 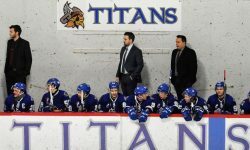 Reilly is a native of Temiscaming, Quebec and the Titans would like to wish him continued success in his hockey career.